The Jindo is a medium-sized, spitz-type dog, with an octagonal-shaped head, and a medium length coat. The tail is thick and may be curled (ring-tail) or straight up (erect tail). Male Jindos are larger in size compare to the female ones. In addition, female Jindos have more fox-like heads. 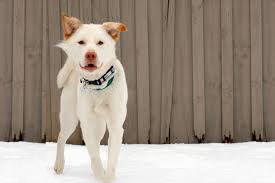 Jindo dogs have all the intelligence, strength, and agility. It is said that they are capable of jumping up to 6 feet high walls, and run over 30mphs. The breed is presented in a completely natural condition. Honorable scars or other evidences of injury resulting from hunting are not to be penalized. The Jindo is a good hunter. They'll hunt animals like deer, wild boars, cold trails of rabbit, squirrels, raccoon, and badger. Jindo puppies are housebroken with little training. Jindos also keep their coats extremely clean. Jindos rarely bark or growl. They might bark/growl is if they feel they are in danger or if their master is being threatened by wild animals/ strangers. Jindos can be the best dog you ever have or the worse. Jindos, by nature, are territorial, they may react aggressively to intruding dogs. Thus, this could result liabilities to Jindo owners. Jindos are highly intelligent but because of their independent nature, respond best to positive reinforcement training only from their masters. Jindos need a lot of space to run around and much love. Jindos have often been known to travel long distances to return to their original owner. They are loyal to their master to the end. As mentioned above, the Jindo specializes in hunting deer, wild boars, rabbits, raccoons, and badgers. It loves hunting and vast open spaces to run and explore. The Jindos are said to recognize and remember over 30,000 different scents. This is why the South Korean military uses Jindos where they learn to recognize thousands of personnel at the military base and to detect outsiders.